2009. Arthur A. Levine Books. Hardcover. 265 pages. With illustrations by Jim Di Bartolo. 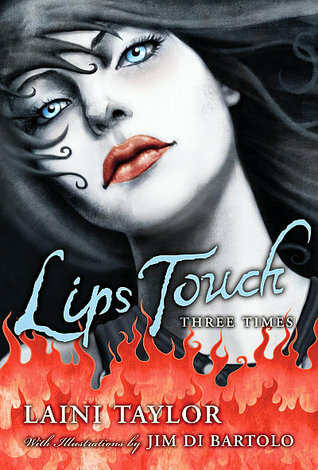 I read the entirety of Lips Touch: Three Times last night, loved it, and immediately knew what I wanted to say about it. First off, Taylor is a natural storyteller – her writing has got a lovely particularity to it that is delightful, and evocative. She knows exactly the details to include. They had no TV but knew hundreds of songs – all of them in a language that Kizzy’s teachers had never even heard of – and they sat on rickety chairs in the yard and sang them together, their voices as plaintive as wolves’, howling at the moon. There were a lot of hairy, blue-eyed uncles strumming old, beautiful guitars, and stout aunts who dried flowers to smoke in their pipes. Cousins were numerous. Small and swift, they were always aswirl in the women’s skirts or dodging the goat like wee shrill matadors . . . They did things in their scattered, crooked sheds that most suburban kids would only ever see in a documentary, or perhaps on a church mission to a third-world country – things involving axes and offal and an intimate understanding of how to turn an animal into a meal. These three compelling, high-stakes stories all involve humans interacting with otherworldly beings and places. As the title promises, all three stories involve a kiss, and each story’s kiss has its own layered meaning – it might be a kiss of revelation, or of sudden belief and fear, or of destruction. It changes things. In all three stories, there is a young woman and an older woman. Each story is about coming of age, with the fantasy elements often serving as metaphors for the transition into adulthood. The older women each try to protect the younger women from danger, based on their own experiences, and are not without influence. But each story shows how the young woman’s path is ultimately her own (though it could be argued that the young girl in “Hatchling” has less agency about what happens to her than the others.) The main male characters – the other half of those kisses – range from stop!danger to he-means-well to long-game revolutionary. The stories have a pleasing progression to them. The first, “Goblin Fruit,” takes place mostly in the human world. The second story, “Spicy Little Curses”, takes place half in early 20th century India and half in Taylor’s loose rendition of a Hindu Hell, where an elderly woman barters with a demon for the lives of innocents. The third story, “Hatchling”, has the most elaborate world-building yet, prominently featuring a nightmarish kingdom ruled by an immortal queen who keeps young humans as pets. In her Author’s Note at the end, Taylor wrote: “Like a magpie, I am a scavenger of shiny things: fairy tales, dead languages, weird folk beliefs, fascinating religions, and more.” She puts her collection of “shiny things” to good use here in Lips Touch: Three Times. I also want to give a shout-out to the illustrations that precede each story. I liked how they depicted the backstories of each of the older women.